Humidity around swimming pools are always very high. Swimming pool dehumidifier for dehumidification around a pool. The high humidity is caused due to the difference in temperature between water and surrounding air. Also, the water is continuously vaporised from the swimming pool. Hence, the surroundings of a pool will always be very humid, reaching 75 to 90% RH. This cause damages to the surroundings. Few of the adverse effects are listed here. You can see water deposits on side walls and nearby areas. This causes peeling of paint and decolourisation. Painting and artefacts in the surrounding will be affected. Mould formation happens on walls. Nearby electronic equipment are affected. Causes corrosion of metal objects, rails etc. 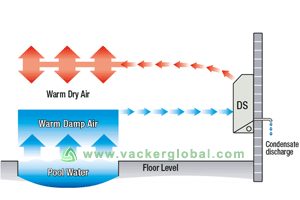 Hence, pool dehumidification is very important which can be achieved by a swimming pool dehumidifier. A dehumidifier reduces humidity by absorbing moisture and converting into water. Condensation dehumidifiers are normally used as pool dehumidifiers. The condensed water is pumped out of the place. Based on the type of installation, there are mainly two types. Non-ducted swimming pool dehumidifier – These models are used for pool dehumidification of smaller areas. It can be installed on the nearby walls of the pool. The condensed water will be drained through a pipe. 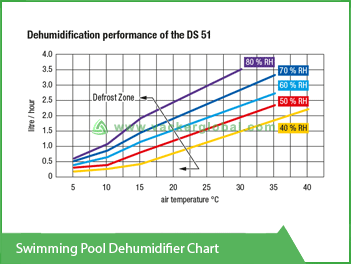 Ducted swimming pool dehumidifier – For a very large pool, dehumidifiers of high capacity are needed. 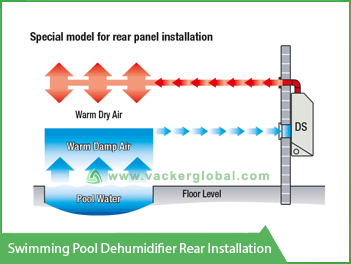 In such cases, ducted models of swimming pool dehumidifiers are used. For proper air circulation, ducts are installed. This is one of our most powerful swimming pool dehumidifier. This is suitable for front panel and rear panel installation. Brief details are explained below. The machine removes 84 liters of water per day when surrounding temperature are 30 °C and humidity is 80 % RH. The machine removes 36 liters of water per day when surrounding temperature are 20 °C and humidity is 60 % RH. For details of performance please see the performance chart. Maximum air volume capacity is 740 cubic meter per hour. The machine can be operated in a temperature range between 15 to 35 °C. The machine can be operated in a humidity range between 30% to 90%RH.